The challenge is that your doctor may miss your need for oxygen all together! What your doctor doesn’t know could really hurt you! What your doctor may not realize is that you are experiencing seriously low oxygen levels that he/she is not seeing while you are seated comfortably in their office. EVEN if your oxygen level is just fine while you are sitting there with your doctor. What your doctor isn’t seeing will cause you HUGE Consequences! If you have water around your ankles you can trust that you have water in your lungs. I have seen supplemental oxygen aid in fluid balance more times than I can count. Though, many health care professionals look at me like I am crazy when I say that. Your health care provider may have never observed that oxygen therapy reverses fluid retention, but the fact remains. You can get rid of water off your ankles with supplemental oxygen. Your heart muscle will gain strength when given consistent support with supplemental oxygen, and the result will be noticeable in reduced fluid retention! don’t let the nurse take the oximeter probe off your finger without doing some normal daily activity! It is good news if you have better blood oxygen levels! Just make sure that you keep a careful watch for any occasion when your low oxygen levels may become an issue again! Even if your oxygen numbers are looking good, enhancing sleep and activity with supplemental oxygen is helpful in many ways! If your doctor is not supportive of your concern for your oxygen level, then please DO get a second opinion. You want a doctor who values the benefits of oxygen therapy. Be aware that there is some unjustified fear of contained gas in a home setting. It IS safe and it is a valuable tool! It’s your health, be your own best advocate AND/OR FIND an advocate if you need someone to speak for you. 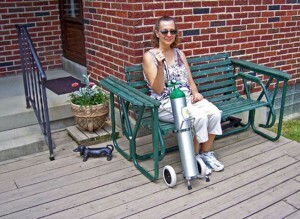 Your oxygen concentrator or generator is a valuable tool! Think about that decision again before you give it up! Do you notice fluid retention, especially around your ankles and abdomen? Fluid retention is a good reason for your doctor to refrain from discontinuing your home oxygen source. In fact, if you have swollen ankles or feel “puffy” with fluid (OR take diuretics to pee) you should fight to KEEP your home oxygen source! If you have water around your ankles and cannot see your ankle bone, you should MONITOR yourself CLOSELY for low oxygen levels. If you aren’t seeing low oxygen levels with your significant fluid retention, keep monitoring. You cannot breathe through water! In fact, learn how your breathing just might be making you sick, even if you aren’t noticing low oxygen levels anymore! Most people have bad breathing habits that make them sick! If you are recovering from low oxygen levels you need to discover how to help yourself with your breathing instead of the harmful bad breathing habits that are currently contributing to your illness! Click on the link below and find out all the reasons to join The Life Breath Club! This is a private membership site to protect your medical privacy.